Purcell, S.W., Samyn, Y. & Conand, C.
Commercially important sea cucumbers of the world. FAO Species Catalogue for Fishery Purposes. No. 6. Rome, FAO. 2012. 150 pp. 30 colour plates. 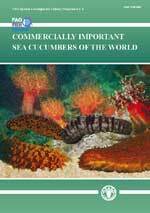 This guide book provides information on 60 species of commercial sea cucumbers including annotated scientific illustrations of the body and spicules; colour photographs of live and dry specimen, information on nomenclature together with FAO names and common names used in different countries and regions; basic information on size, habitat, biology, fisheries, human consumption, market value and trade; geographic distribution maps. The volume is fully indexed and contains an introduction, a glossary, and a dedicated bibliography.